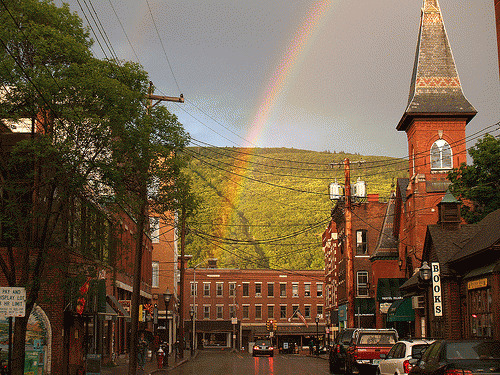 Brattleboro, Vermont, site of Tuesday’s vote to indict George W. Bush. 7:45 pm EDT. Brattleboro becomes one of the first cities, perhaps the first, in the United States to indict President Bush and Vice President Cheney for "crimes against the constitution." The measure listed below, was voted on today in Brattleboro Vermond. Turnout was heavy, nearing 50% and activists were out in strength to help get people to the polls. The measure is symbolic since neither Bush nor Cheney have nay plans to visit Vermont soon. However, candidate Dobson from Maine introduced a similar measure in Kennebunkport, Maine (see below) which may come up for a vote in the summer. This was reported to Michael Collins by Maine U.S. Senate Candidate Laurie Dobson who was supporting the election by taking exit polls today in Brattleboro. "Shall the Selectboard instruct the Town Attorney to draft indictments against President Bush and Vice President Cheney for crimes against our Constitution, and publish said indictment for consideration by other municipalities? And shall it be the law of the Town of Brattleboro that the Brattleboro Police, pursuant to the above-mentioned indictments, arrest and detain George Bush and Richard Cheney in Brattleboro if they are not duly impeached, and extradite them to other authorities that may reasonably contend to prosecute them." Barry Aleshnick is a Brattleboro resident and one of a small group of activists campaigning for passage of the initiative. In an interview on the evening of March 2nd, he said the failure of Congress to act on impeachment inspired the Vermont effort. Aleshnick described how Kurt Daims started the process by developing the resolution. At the outset, "Daims stood alone on streets gathering signatures," according to Aleshnick. Others joined the effort and they’re now working together to gain passage in Tuesday’s vote. Aleshnick observed that Bush acts "like he’s above the law" when he invades nations for no reason" and engages in torture around the world. The local initiative is one readily available alternative available to citizens to hold Bush and Cheney accountable for "criminal behavior" in the absence of congressional action, he said. Aleshnick is "optimistic about passage of the resolution."